Don't look at Them. Never let Them know you can see Them.That is Ethan Chase's rule. Until the fey he avoids at all costs—including his reputation—begin to disappear, and Ethan is attacked. Now he must change the rules to protect his family. To save a girl he never thought he'd dare to fall for. Just when the tears are dry over the ending of Julie Kagawa's Iron Fey, she presents readers with the first story starring none other than Ethan Chase. That's right folks, little Ethan is all grown up and the baddies from the Nevernever are hot on his trail. If you are a big fan of Mahan, Ash, and Puck this is not the read for you. Yes, they cameo, but this story has more to do with a cast including new baddies, new buddies, and new loves...all for Ethan. Ethan comes off as very up tight for a major portion of this story, but that is only because he is trying to stay as far away from the world of the fey as he can. That is until friends of his are in danger; then he heads into a Nevernever much changed from the one he remembers. It seems that the realms of the Summer and Winter courts are shrinking as fey disappear in droves. All the while, a new race composed of the ghost-like Forgotten, are making themselves known. What's an unlikely prince to do? Jump in with both feet, find his friend, save the world, and get the girl of course. This is a wonderful start to what promises to be a great series. 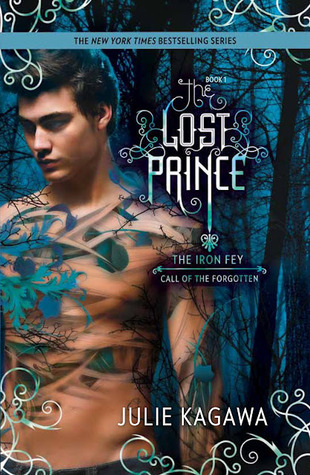 There may be tie-ins to the Iron Fey, but don't expect this series to rest on the laurels of its famous predecessor. The characters found in The Lost Prince are strong, well rounded, and very well written. This book will draw you in, just as the first did and not let go until the last word. This looks so great! I still haven't read the entire original series yet. I might need to take an emergency trip to the bookstore! I just finished The Iron King and it was amazing! I can't wait to read the rest of the series.